Family Sunday Brunch-Latest [email protected] Méridien Suvarnabhumi, Bangkok Golf Resort & Spa;Sponsor Review. [SR] Family Sunday Brunch-Latest [email protected] Méridien Suvarnabhumi, Bangkok Golf Resort & Spa;Sponsor Review. Mini Review: join Like page, Like and share post on Facebook. Hello, everyone! We met again! 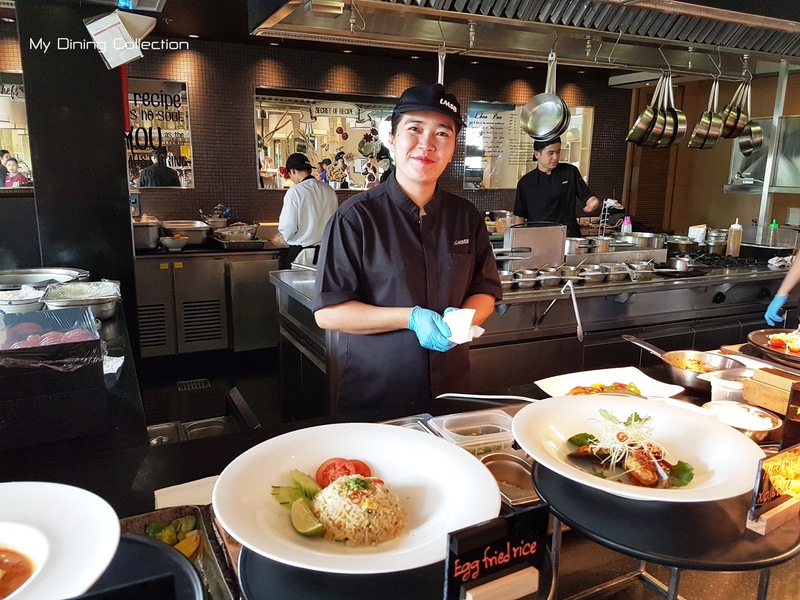 This time, I will bring you all to meet a wonderful "Family Sunday Brunch" at the Latest Recipe, Le Meridien Suvarnabhumi, Bangkok Golf Resort and Spa, a 5 star hotel and resort by Marriott International. It's very private, distinguished and unique with great quality of brunch selection. Food and ingredients are imported and local-sourced, all well selected for you! There are almost 20 dishes fine dining menu to enjoy in this brunch with coffee and tea bar, complimentary half lobster per person and access to Infinity Pool plus Le Meridien Kids Club! Welcome to Le Meridien Suvarnabhumi Bangkok Golf Resort & Spa. There is the Hotel Shuttle Bus Service to Megabangna Shoppingcentre and BTS Udomsuk (E12). ด้านหน้าของห้องอาหาร/ Entrance of the restaurant with friendly staff. Latest Recipe is the signature restaurant of Le Meridien Hotels worldwide. I love this hotel brand because of the great quality of service and many factors of the hotel. But! I promise! I will tell you the truth for every review! Latest Recipe: an interactive dining experience inspired by international flavors, the restaurant offers a culinary collection and selection of recipes from Le Meridien Hotels around the world. As for Le Meridien Suvarnabhumi, Bangkok Golf Resort and Spa, the hotel features Buffet Breakfast, Weekend B.B.Q. Buffet on Friday and Saturday night, Family Sunday Brunch and a la carte service. ห้องอาหารล้อมรอบด้วยกระจกใส และต้นไม้/Decorated with clear window and lush shades of trees. Decorated with clear glass windows, the restaurant is laminated natural lights while surrounded by shades of trees. It is also adjacent to a cool Infinity pool next to the restaurant which makes the visit more relaxing. You can also enjoy your brunch inside or outside the dining room as you wish. ตั้งอยู่ติดกับสระว่ายน้ำเลยล่ะครับ/Located next to the Infinity pool. Relaxing atmosphere can be found both during the day and night. (I have ever had dinner here last year), I feel very exclusive because it’s located in the heart of an iconic Summit Windmill Golf Club. มีบริการไวไฟฟรี 2 ชม. ด้วยนะ ไว้อัพรูปสวยๆอวดเพื่อน/Free Wi-Fi Service in Dining Room. Then, join me! Let's see the food of this wonderful brunch. They are full of quality! Starting with Family Sunday brunch, from July to September, there is a wide selection of French fusion dishes with the concept "From Paris To Bangkok". These menus are served at the Carving & Live Station, which are cooked meticulously almost 20 menus! Oder by using table's number clip like this. Foie Gras with Tamarind Sauce, Grilled Beef, Beef Bourguignon, Grilled Lamb. ไข่ออนเซ็นในซุปเห็ด นุ่มละมุนหอม, เนื้อผัดพริกไทยดำ,เนื้อแกะผัดกับใบกะเพรา, ตับห่าน ย่างกำลังดีทานคู่ขนมปังไม่มันเลี่ยนไม่มีกลิ่น, ขาเป็ดกรอบกงฟี กรอบนอกนุ่มใน, ซุปเห็ดหอมมากๆ, กอโกแว็งไก่เคี่ยวในซอสน้ำสต๊อก, ปลาหมึกชุปแป้งทอดราดซอสต้มยำ/Onsen Egg, Beef with Black Pepper, Stir-Fried Lamb with Basil, Foie Gras, Duck Confit, Mushroom Soup, Coq Au Vin, Deep Fried Squid with Tom Yum Sauce. ล๊อปสเตอร์ย่างครึ่งตัวต่อท่าน, หอยแมลงภู่ผัดไวน์ขาว หอมมากๆ, ต้มยำกุ้ง, ซุปไส้กรอกกับถั่วขาว, ซุปกิมจิ, หอยแมลงภู่ผัดซอสเอ็กโอ เข้มข้น, ผัดผักรวม, ข้าวผัดไข่สำหรับหนูๆ/ Half-Grilled Lobster(per person), Mussel White Wine, Tom Tum Goong, Cassoulet, Kimchi Soup, Mussel with X.O. Sauce, Stir-Fried Mixed Vegetable, Egg Fried Rice. ***Personally, Foie Gras prepared by Le Meridien's chef is my most favorite so far. ปลากะพงอบ, ไก่อบ, เนื้อโทมาฮอค/Sea Bass, Roasted Chicken and Tomahawk. ซอสต่างๆ, มันฝรั่งอบกับเบคอนสไตล์ฝรั่งเศล,เทมปูระ/Sauce, Bake-Potato with Bacon and Tempura. ปลากะพง, ทูน่า, แซลมอน และผักต่างๆ/Sea Bass, Tuna, Salmon and Vegetable. ปูม้า, กุ้งลายเสือ, ไส้กรอก และปีกไก่/Blue crab, Tiger prawn, Sausages and Chicken. มีทั้งเนื้อวัว, เนื้อแกะ และนื้อหมู/Beef, Lamb and Pork. Note: The lamb is very tender. Beef is so good too. In fact I mostly do not like beef but this is soft and delicious. You will get half grilled lobster per person. ปูอลาลสก้า, กุ้งลายเสือ, หอยแมลงภู่,ปลาหมึก และกั้ง/Alaskan Red King Crab, Tiger Prawn, Mussel, Squid and Rock Lobstar. หอยนางรมนำเข้าถึง 5 ชนิด!/For oyster lover, there are 5 kinds of import oysters! Normandy, Jersey, Finedeclaire, Korean and Iraland. ซูชิ ซาชิมิต่างๆ อาทิ แซลมอน ทูน่า /Sashimi and Sushi. สลัด, ยำ และส้มตำ/Salad, Thai Spicy salad(Yum) and Papaya Salad(Som tum). ขนมปัง,เนย, แยม, คุกกี้ และเมอแรงค์/Breads, Butter, Jam, Cookies and Meringue. ชีสหลากชนิด พร้อมผลไม้แห้ง ธัญพืช และน้ำผึงไว้ทานคู่กัน/Imported Cheeses with dried fruit, whole grains and honey. ข้าวเหนียวมะม่วง, เครปซูเซท และท๊อปปิ้งต่างๆ/Manga Sticky Rice, Crepe Suzette and Topping. ไอศกรีมโฮมเมดโดยทีมเชฟเบเกอรี่/Homemade Ice Cream by Pastry Chef Team. ชาเขียว, มอคค่าแอลมอน, วานิลา, ชาไทย, น้ำผึ้งสัปรด และช๊อกโกแลต/Green tea, Mocha Almond, Vanilla, Thai tea, Honey pineapple and Chocolate. Oh no! The children are full! Children usually eat less than adults for sure. This must be busy!? However as I said before, there is Family Kids Club and Kids pool to save your brunch time! Parents can enjoy their brunch when kids are enjoying themselves at Family Kids Club and pool. Welcome to LMSB Family Kids Club! On Sunday, Family Kids Club is opened at 11.00 -17.00 hrs. There are staff standing-by while you enjoy your brunch. In this kids club, special weekly activities are also available for them to unlock their imagination. The kids can enjoy and learn here. The week we visited, the kids enjoy ‘Making Your Own Candle’ class: it’s an easy candle making activity with crayon and cartoon mold, very colorful and fun to watch! At Infinity pool, the parents and their kid(s) can use throughout the day. There is a kid’s pool for children to play, adult pool too. I also recommend that when your children enjoy their time at the pool, please supervise very closely, no matter which pool and please follow the rules of the pool strictly. The menu is very diverse. (see the photo I have reviewed). The selections are fresh, good quality and local sourced. They are cooked by chefs who understand the materials well, it pulls out the flavor of food fully. Live station also serves beautiful and delicious dish actively but sometimes may be slow when they have a lot of orders at the same time which is normal. The selection of meats and local sourced seafood at B.B.Q. station are very good too. The desserts disappoint me a little bit. The taste is good, light and sweet but they are creaminess of milk, butter and some bakery ingredients but that shows that the dessert is not added synthetic aroma (or added very less). The Crepe Suzette is a perfect and delightful touch. The Ice creams are really great!!! Especially vanilla flavor. (The withe one.) and for tea and coffee are very aromatic. Let yourself enjoy the nature and good food like its concept ‘Savour the Good Life’ with your family. The overall atmosphere is very friendly and welcoming, making it a perfect getaway with family on Sunday afternoon. Le Méridien Family Kids Club is located at the level 1, next to the lush green lawn. Though your kids might be off your sight but there will be a few staff at the club to assist and lead them with weekly activities. If they feel like swimming, the kids’ pool is available next to the main ones. There might be Pool Attendants on duty but I strongly recommend to follow the Pool Rules. When we arrived, the staffs were very welcoming and helpful. They always pay attention to guests and tried to assist with any needs possible; it truly shows the service-mindedness that comes from within. Very attentive staff, well done! With great food, service and relaxing resort atmosphere, the price might be a little bit high but if you follow the hotel’s news through its social media channel, I can guarantee that you will get the good deal for sure. As for transportation, it could be difficult if you don’t have personal vehicle but no worries, you can use the hotel’s Shuttle Bus Service that will pick you up from Megabangna Shoppingcentre and Udomsuk BTS station (please call in advance to check the schedule at 02 118 7777). Thank you for enjoying my blog! Because People Can Be Connected By Food.